Partners in Crime | Barbie Who? My husband had the day off from work, so we decided to spend the day doing something we both enjoy: thrift shopping. We went to four different places, and I got quite the haul! Check it out. At one store, I found 7 skeins of cotton yarn, black lace, and snap closures. I was so excited to find the closures! I will need them to finish Cofelia’s outfit, and it is always a relief when I don’t have to buy something at the hobby shop. They only cost $0.10 and the package has enough snaps in it to complete half a dozen outfits. At another store, I purchased a bag of miscellaneous knitting supplies. I bought the bag because it had a knitting needle gauge (something I desperately need), but I am just as happy with the rest of the ‘extras’ in the bag. There were needle tip savers, place markers, and a Pom-Pom maker. I know that I’ll make good use of it all. The third store we went to didn’t have any crafting finds, but I did find a sweet pair of winter boots. They look completely new! I want to make a pair of cuff savers for them with some blue yarn I found a few weeks ago. It will be a quick little project that I’ll tackle after I finish Cofelia. The fourth store we went to wasn’t a thrift store; it was a dollar store. We needed to buy some sports drinks for his workouts. They have some generic dolls there, but they’re all blonde. I would consider buying one or two if they had ginger or brunette dolls. Until then, I shall stick to my thrifty dolls. The one disappointing thing about the trip was the fact that I didn’t see any usable dolls. One shop had a few dolls, but they were broken and overpriced. Nobody is going to pay for two generic dolls with a missing arm and broken leg. Well, maybe somebody would, but I can’t fathom why. When I worked at a thrift store, we would have thrown that away; it never would have made the floor. Broken things aren’t cool. There was also a creepy little girl doll (probably from the 60’s or 70’s) with vacant eyes they priced at $4. It was faded and the eyes moved, but it just have me a weird vibe. I passed on her. I like vintage, but it just wasn’t something that fit with the project. After the thrift-store shopping spree, we got a pizza and went to a drive-in movie. We saw Maze Runner. That movie was just a long string of WYF moments, but I genuinely enjoyed it. I hope they have the three books in the Maze Runner trilogy at our library so I don’t have to wait for the second movie next year. That’s a pretty impressive haul! I’m sorry you didn’t find any dolls, though. Knowing me, with Halloween coming up so quickly, I would’ve bought that vintage doll as a decoration for our set up (also, you can’t ever have too many creepy things). Very true! I am sure that somebody will decide that doll completed their holiday setup. Or maybe it is worth a fortune and I’m a fool for overlooking her. lol Either way, I’m sure she is in better place than with me. Stopped by to take a look and fell in love with your blog immediately. 1) OMG header graphic, Whovian and Barbie, oh my! 2) I adore thrift stores and all the fab finds. 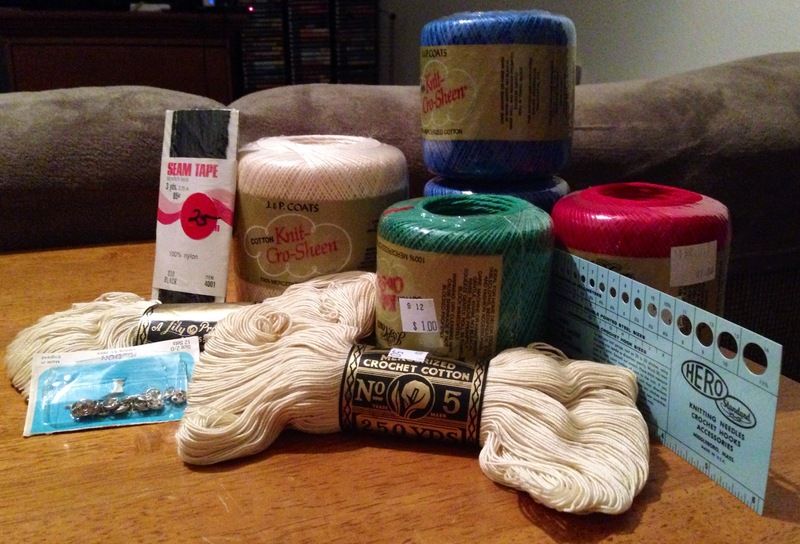 3) You are a craft addict as well, so nice to see we have a support group. Hugs all around and thanks for blogging it all for the world, love it!